Bill Owen Hand Numbered Limited Edition Giclee on Canvas:"Caught a Little Deep"
Image Size: 9x12 / Multiple Sizes Available - Select Option Above. Edition: Hand Numbered Limited Edition to 100. About the Art: "Caught a Little Deep" is the last painting Bill Owen created prior to his passing on June 15, 2013. The oil on canvas measures 34"x34" and Bill painted it to be his catalog piece for the 2013 Cowboy Artists of America Sale and Exhibition which was held at the National Cowboy & Western Heritage Museum in Oklahoma City, on Saturday, October 12, 2013. Bill was especially looking forward to attending the show, where he would have celebrated his 40th anniversary with the Cowboy Artists of America, an affiliation that Bill loved so much, and enjoyed throughout the largest portion of his career. Due to Bill's untimely passing, the group and the museum decided Bill's final painting would be offered at auction, instead of at a fixed-price, luck of the draw sale. Bill's painting was not eligible for any awards, except for the Buyer's Choice Award, which is voted for by secret ballot by all attending the show; and "Caught a Little Deep" was selected! Bill would have been extremely proud of the successful show, and especially proud of winning the Buyer's Choice Award. It was a very befitting and appropriate end to a brilliant career. 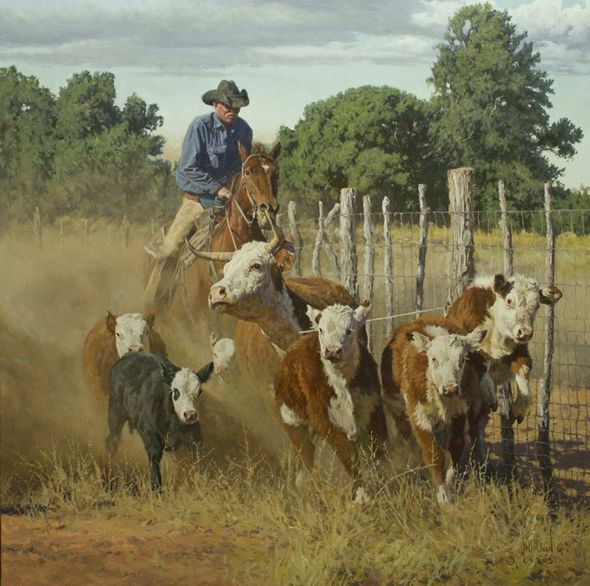 The painting takes place on the historic Babbitt Ranches in northern Arizona; the ranch Bill painted more than any other throughout his career. The cowboy in the painting is Jack Rodgers, who has been a cowboy at Babbitt's for many years.